I made this for nobody special. I like to have cards on hand. 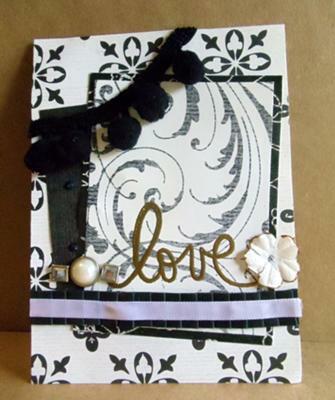 Add cardstock, pattern papers, and trim. Pleat a black paper strip and add ribbon down the center. A the pleated strip and brads. Color the tips of flower with a gold marker. Stickle the center and adhere to cards.